At Valparaiso University, Ruyue Yuan has found a connection between math and music that might surprise most people. “They’re both beautiful,” Yuan said. Yuan has been playing the violin since she was 6 years old. She loves music. In fact, she enjoys studying all of the humanities, but she also has a natural gift for mathematics. So when she followed in her father’s footsteps — he was a visiting scholar at Valpo in the early 1990s — and came to Valparaiso University from her native Hangzhou, China, she was excited she wouldn’t have to choose between her passion for math and her love of music. The interdisciplinary nature of her studies in Christ College — The Honors College allows her to pursue both a math major and her interest in the humanities. She’s also a member of the Valparaiso University Symphony Orchestra. As a violinist, Yuan has the opportunity to study one-on-one with Yuan-Qing Yu, an artist-teacher in Valparaiso University’s music department and a member of Chicago Symphony Orchestra who is also from China. “Every year she and some other musicians perform in the Christmas Concert,” Yuan shared. This year Yuan will get the chance to join her teacher for a performance at Orchestra Hall at Symphony Center in Chicago on Sunday, Dec. 8. In fact, it’s Yuan’s professors who are making her time at Valpo so special. She said many have become a lot like a second family to her — which is important to her as an international student who is so far from home. “My teachers not only teach me to play violin, they teach me to be a better person,” she said. It was one of her mathematics professors — Associate Professor of Mathematics and Computer Science Lara Pudwell — who introduced Yuan to the beauty that math and music share. “She offered me an opportunity to be on her research team, and it was fantastic,” Yuan recalled. Finding the truth through math is something Pudwell works hard to impart to her students. Now Yuan can’t help but see math everywhere, including in the music she plays with the orchestra. Valparaiso University continues its 80-year tradition of ushering in the season with its annual Christmas Concert. 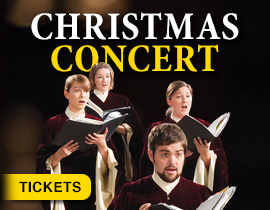 Friday, Dec. 6, 7:30 p.m. and Saturday, Dec. 7, 5 p.m.